I often hear from friends and clients that their lives are so busy they barely have time to stop and think for themselves. They blast through each day attuned to everyone and everything else around them, but they don’t take the time to be in tune with their own thoughts, feelings, and emotions. I can totally relate because I did that myself years ago. I felt like life happened around me, and that I wasn’t a full participant in it. I’d be running around, filling up my day with…I’m not entirely sure what, because I don’t have a lot to show for it, all the while accepting it as a way of life. I was aware enough to know that mentally and emotionally I wasn’t doing myself any favors. Being a major people pleaser at the time, I thought it equated to me being this amazing, whole person who cared so much and gave so much that I should feel all warm and fuzzy and fulfilled. Sadly, not even close. As I spent all my time doing for everyone else, I neglected my personal needs and wants. I didn’t even know what those were. And then my body chimed in and let me know that I was headed for trouble. This way of life was not working out well at all and I came to an understanding that change needed to happen. I knew it had to start with my mindset. I knew that I needed to make personal awareness a priority. I’d been very aware of what others needed, but not so much for myself. I decided to start incorporating a mindful connection with myself each day. It took time, patience (not my strength), and diligence, but I’m a better person for it. Now my days include empowered mornings of gratitude, positivity, and setting healthy intentions. Throughout the day I take a few mindful moments to check in and see if I’ve held true to those intentions, and if I’ve made decisions that are in alignment with who I am and what I stand for. To finish the day strong I’ll spend about five minutes in the late evening reflecting on how the day went, how I felt, how I handled situations, and then celebrate another day of personal growth and progress. Being mindful isn’t hard work or time consuming. It can be done anywhere for any length of time you choose. Mindfulness is a choice we make to be present and to live in the moment, being fully aware and appreciating that moment. How often do we think to ourselves that we don’t want a particular moment to end? Maybe its while watching a beautiful sunset, or enjoying a breathtaking view over a vineyard with a glass of wine, or precious time spent with friends and family, or watching the dying embers of a fire where we’re cozy, relaxed, and content. Our minds need these pauses, these little blips of time, to connect our senses with our feelings with our bodies, with our thoughts. We’re all capable of having mindful moments, but sometimes it’s the act of actually allowing ourselves to just take that break away from life or worrying over bills, money, the kids, the job, and just giving ourselves full out permission to tune in to our personal truth. Being mindful has nothing to do with being lazy or selfish. It’s appreciating the texture of wood, the tantalizing aroma of food baking, the dancing flame of a candle, the cry of loons along the lake, the tang of a strawberry rhubarb pie. It’s recognizing that you aren’t content and figuring out ways to get happy again. It’s allowing your inner voice to be heard, the one that ends up muted for so long that you hardly even recognize it. For myself I’ve learned that mindfulness is a necessity. I’m more alive because once again I’m a participant in the world. I experience life around me utilizing all my senses. I see with fresh eyes and I nurture my needs and wants. Pauses give me the freedom to dream and they fuel my creativity. They’ve have helped me to recognize that while people pleasing left me hollow, I find true fulfillment from helping and serving others through a harmonious exchange where I receive just as much I give. We miss out if we aren’t able to spend time with our thoughts. We need to reconnect with who we are so we can grow and evolve. 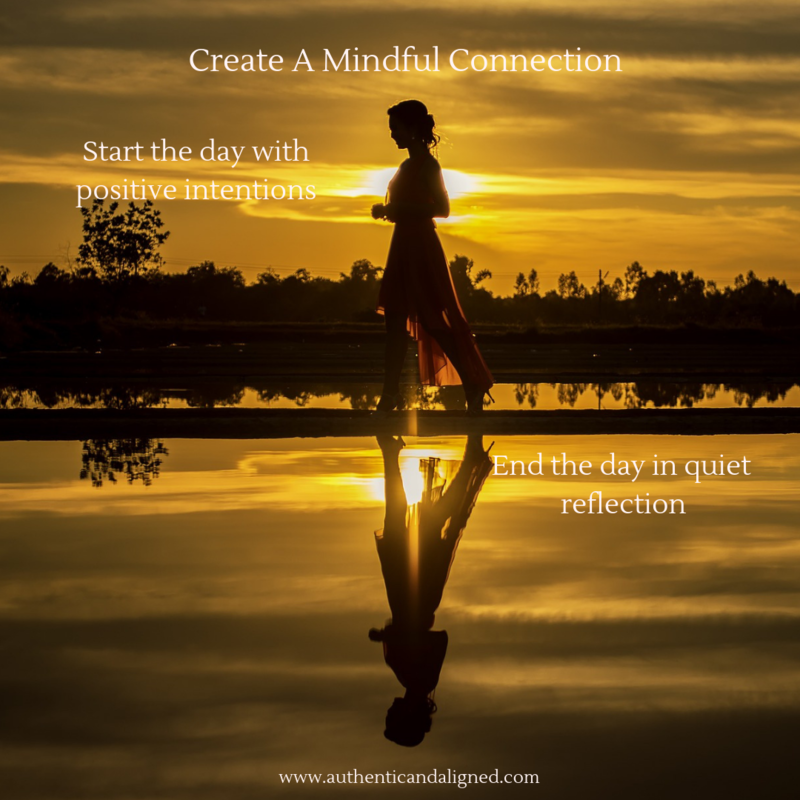 Spare a few minutes each day to create mindful connections. Take time to breathe into the moment and simply be. Give yourself permission to enjoy this life rather than getting caught up in it. Ruminate to illuminate. Nancy Jackson, owner of Authentic and Aligned, is a holistic wellness coach with specialties in mental health, emotional eating, authenticity, and reiki. She specializes in helping women who are ready to make changes, but feel overwhelmed, uninspired, and stuck, to take action by reigniting their inner power so they can start loving themselves completely and lead a happier, more meaningful life.